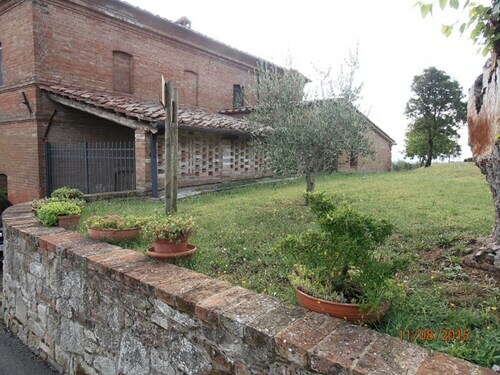 Situated in a rural location, this farm stay is 1.3 mi (2.1 km) from Monte Oliveto Maggiore Abbey and within 6 mi (10 km) of Museo del Tartufo and Val di Chiana. San Giovanni d'Asso Station and Crete Senesi are also within 6 mi (10 km). 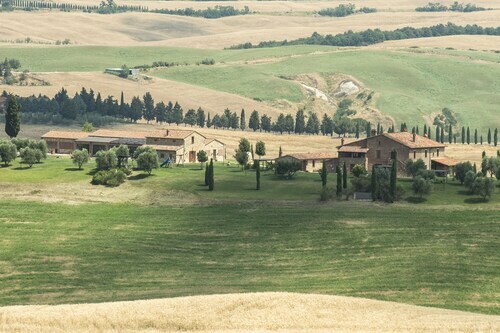 Situated in Asciano, this farm stay is 2 mi (3.2 km) from Monte Oliveto Maggiore Abbey and within 9 mi (15 km) of Crete Senesi and Museo della Mezzadria. Museum of Sacred Art in Val d’Arbia and Museo dell'Antica Grancia e dell'Olio are also within 9 mi (15 km). Casale Rasa 16+2 Sleeps, Villa With Private Pool at Exclusive Use! 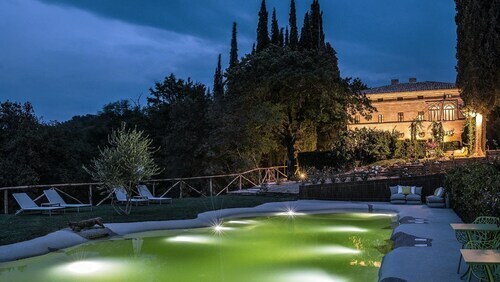 Situated in the mountains, this romantic farm stay is 2.9 mi (4.7 km) from Monte Oliveto Maggiore Abbey and 3.1 mi (5 km) from Museum of Sacred Art in Val d’Arbia. Museo della Mezzadria and Val di Merse are also within 9 mi (15 km). Situated in Buonconvento, this villa is 2.8 mi (4.5 km) from Museum of Sacred Art in Val d’Arbia and 2.8 mi (4.5 km) from Museo della Mezzadria. Monte Oliveto Maggiore Abbey and Val di Merse are also within 9 mi (15 km). Situated in Asciano, this farm stay is 3.1 mi (4.9 km) from Museo del Tartufo and within 6 mi (10 km) of San Giovanni d'Asso Station and Val di Chiana. Crete Senesi and The Saints Peter and Andrew Church are also within 9 mi (15 km). Situated in Buonconvento, this property is within 6 mi (10 km) of Museo della Mezzadria, Museum of Sacred Art in Val d’Arbia, and Val di Merse. Monte Oliveto Maggiore Abbey and Torrenieri Montalcino Station are also within 12 mi (20 km). Situated in Asciano, this country house is 1.6 mi (2.6 km) from Val di Chiana and within 6 mi (10 km) of Crete Senesi and Museo del Tartufo. San Giovanni d'Asso Station and The Saints Peter and Andrew Church are also within 6 mi (10 km). Situated in a rural location, this townhouse accommodation is 2.9 mi (4.6 km) from Museo del Tartufo and 3 mi (4.9 km) from San Giovanni d'Asso Station. Val di Chiana and Crete Senesi are also within 9 mi (15 km). This family-friendly Asciano property is located in a rural location, within 3 mi (5 km) of Museo del Tartufo and San Giovanni d'Asso Station. Val di Chiana and The Saints Peter and Andrew Church are also within 9 mi (15 km). Situated in a rural location, this vacation home is 2.9 mi (4.6 km) from Museo del Tartufo and 3 mi (4.9 km) from San Giovanni d'Asso Station. Val di Chiana and Crete Senesi are also within 9 mi (15 km). Situated in a rural location, this historic property is within a 15-minute walk of Museo del Tartufo and San Giovanni d'Asso Station. Val di Chiana and Torrenieri Montalcino Station are also within 6 mi (10 km). Sink into the peaceful environment at Monte Oliveto Maggiore Abbey. You will find it in Asciano, so if you're flying into Rome, the country's capital, you'll have a distance of 100 miles (161 kilometers) ahead of you. There are 2 accommodations in the vicinity, so it'd be a wise idea to book ahead of time. Within 2 miles (3 kilometers) of Monte Oliveto Maggiore Abbey you’ll find the Villa Armena and Fattoria. A quick commute away, there are a small number of wallet-friendly accommodations to take your pick of. The Bolsinina Bassa and the Casa Bolsinina are some of the known establishments. We know how exhilarating exploring can be, however, your thoughts will eventually turn to your grumbling stomach. Only 0.2 miles (0.3 kilometers) from Monte Oliveto Maggiore Abbey is where you'll find Ristorante La Torre (Localita' Monteoliveto Maggiore, 2, Asciano), a great place to sit back and enjoy a satisfying meal. If you don't mind a bit of self-enlightenment, go and check out what's being presented at Museo del Tartufo. History fans should plan to visit Museo della Mezzadria, a place where history comes to life with stories from the past. Go to see the beautiful artworks that are currently on display at La Porta Gallery. Note the textures, shapes and colors of the artworks featured at Museum of Sacred Art in Val d’Arbia. Develop a better understanding of the spirit of the area by walking around The Saints Peter and Andrew Church, a local place of worship. How Much is a Hotel Room in Monte Oliveto Maggiore Abbey? Hotels in Monte Oliveto Maggiore Abbey start at $78 per night. Prices and availability subject to change. Additional terms may apply.